Conservation experts from the UK found a rare bat in the jungle of Sumatra. Bats found in known as the barong Ridley (Hipposideros ridleyi), a species classified as threatened with extinction in the list of the International Union for Conservation of Nature (IUCN). 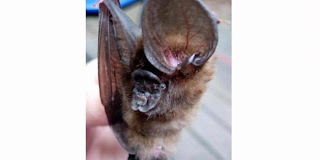 Species of bats were found in forest fragments that extent only 300 hectares. Fragment is surrounded by oil palm plantations, which opened in the forest area and expanded so that penetrated an important habitat for the survival of endangered animals. Researchers said the findings showed that even small forest fragments remain valuable to be preserved. The oil palm plantation managers must identify areas in need of preservation. Forest fragments where the bats invention is part of the forest managed by the owners of oil palm plantations. In order to preserve wildlife, the researchers asked the plantation owners to identify areas in need of preservation. Furthermore, the researchers said that the network of forest fragments may be appropriate to preserve certain species. "The scientific community must help the business community so that endangered wildlife can still exist in areas that are managed in the long run," said Matthew Struebig of Queen Mary, University of London, one member of the research team. A discussion of conservation issues and their relation with oil palm plantations made on Tuesday (08/11/2010) in Jakarta. Sophie Persey of the Zoological Society of London as well as Palm Plantation Project Manager said, "Forest protection is always a priority in conservation. However, if the palm oil expansion program is still being done, then protecting the forest fragments in oil palm plantations also becomes important to maintain Indonesia's biodiversity. "